In a desultory way I have been articulating a theory about religious belief over the last few years. As someone interested in factual accounts; as someone who's worldview has been changed by new facts on several occasions; and as someone who regularly spends a fair amount of time amongst credulous religious believers, I've been fascinated by the relationship between reason, factual information, and beliefs. Furthermore I apply results published by Antonio and Hanna Damasio which suggest that emotions play a key role in decision making. (I outlined this idea in a blog called Facts and Feelings). Most real world problems are complex and making decisions about them, including deciding what we think is true, requires us to sift and weigh up a broad range of information. Before we can make a decision we have to assess the relevance of the information or category of information to the decision at hand, i.e. what is salient. Most of this process is unconscious and is based on emotional responses. Or in other words emotions function to help us decide what is important in any decision making situation. Decisions are then made by comparative weighing up of our emotional responses to the solutions we are aware of and have judged to be salient. Once a decision is made it is then rationalised to fit an existing personal narrative. This insight was also outlined at a library marketing seminar I attended almost 20 years ago. The ability to unconsciously determine salience is what we often call our "gut feeling" or "intuition". This type of unconscious information processing seems to rely on pattern recognition and considering many options at once (parallel processing). The end result is decisions made with no conscious awareness of the process of thinking it through. Indeed the result often comes to us in a flash or after a period of sleep. The speed of this type of processing seems to contraindicate the usual cognitive processes of conscious problem solving, so that the answers that come via this route may not be fully integrated into the sense of self - spatially the answer comes from nowhere, or from outside us. Thus this kind of information process can coupled with views about metaphysical self that is not tied to the body and become "divine inspiration". (See Origin of the Idea of the Soul which relies on work by Thomas Metzinger). The cognitive gap that opens up when we set aside information as non-salient is often filled by what neuroscientists call confabulation. Oliver Sachs poignantly described a man with no ability to make or retrieve memories (see Oliver Sach's Confabulating Butcher). Asked why he is present in the hospital or engaged in an activity he cannot say, but instead confabulates - he produces a plausible story and presents it as truth. There is no conscious lie, and the patient is not trying to deceive his interlocutors. He is presenting the most plausible account of himself that he has, despite being aware of inconsistencies, because he has no other account and the state of not being able to account for himself seems to be unacceptable at an unconscious level. Something similar happens whenever we have a flash of insight or intuition. The thought pops fully formed into our heads and then we confabulate a story about how it got there, and this generally speaking has nothing to do with how the mind or the brain works. Thus conscious thought is not a good paradigm for how the mind works. It is the just the tip of the iceberg. Now this theory is still rather nascent and a bit vague. I'm still getting up to speed with the literature of evolutionary approaches to religion, though my views seem to have much in common with scholars like Ara Norenzayan. The theory does make an interesting prediction. It predicts that where people have strong existing views they will treat new contradictory information in a limited number of ways depending on how they feel about it. Where a view entails a major investment of identity and social status (e.g. a religious view) a person will tend to judge contradictory information as not salient and reason in such a way as to set aside the new information without having to consider the real implications of it. My idea was that this could be tested at some point on people with religious beliefs. On paper it does seem to account for some behaviours of religious people with respect to new information, for example the Christian fundamentalist confronting the facts of evolution. With all this in mind I was fascinated to read an article by Steve Keen describing something very similar in the field of economics. Keen highlights a paper by Dan M. Kahan et al. "Motivated Numeracy and Enlightened Self-Government" Yale Law School, Public Law Working Paper No. 307. Keen, formerly Professor of Economics & Finance at the University of Western Sydney, is best known for his vehement polemics against the Neoclassical consensus in economics, epitomised in his book Debunking Economics. Neoclassical economics is what is taught to virtually all economics students at all levels across the world and has a monopoly over economics discourse that is disproportionate to its success as a body of theory. Keen is one of a small number of economists who predicted the economic crisis that began in late 2007, and probably the only one who did so on the basis of mathematical modelling. One of his main criticisms of Neoclassical economists is that they ignore debt in their macro-economic models because aggregate debt cancels out: if I borrow £1 and a bank lends me £1 then the balance is zero. On the face of it this seems reasonable because our view of banks is that they lend out deposits. But in fact banks lend orders of magnitude more money than their actual deposits. When they lend they, in effect, create money at the same time. Problems occur when too much debt builds up and the repayments become a burden. For example private debt in the UK soared to 500% of GDP or five times the annual economic output of the whole country. Conditions may change and render debtors incapable of repaying the debt, which is what happened on a huge scale in 2007 and the sub-prime mortgage scandal. The levels of debt at that point meant that banks started to become insolvent as their income from interest payments plummeted and their own ability to service debts was compromised. From their the crisis spread like toppling dominoes. Thus banks and debt are far from neutral in the economy. Perhaps in a post-crash world in which the role of banks in creating the crisis through a massive over-expansion of the money supply is public knowledge, the theory might be expected to change? But it has not. A global economic crisis has not caused any great soul searching amongst macro-economists who did not see it coming. Tweaking is the main result. Keen predicted the crash on the basis of the rate of change of debt. As we take on debt (private rather than public debt) growth ensues and , for example, employment levels grow. 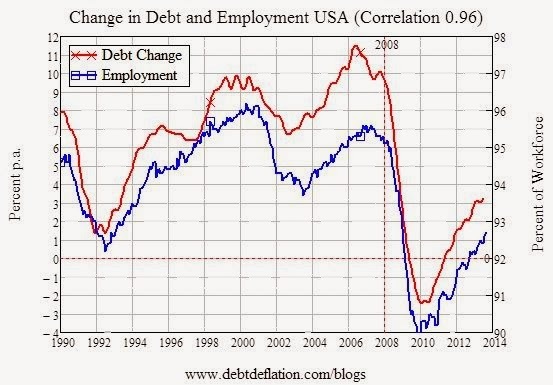 As shown in this graph there is a tight correlation (0.96) between changes in debt and the employment rate. Thus when the rate of change of debt began to fall sharply in 2006 it was a harbinger of collapse in the economy. In the USA employment levels fell from 95% to 90% and have yet to fully recover. This mathematical analysis ought to have been of interest to people trying to predict the behaviour of economies. Especially in post-crash hindsight it ought to be interesting to those whose job was to predict how the economy would perform and utterly failed to see the worst economic disaster in a century coming. As late as mid-2007, just months before sub-prime began to kick off, the OECD were still predicting strong economic performance in their member countries for the foreseeable future. However Keen's work, and the work of other economists who were successful in predicting a major recession/depression has been roundly ignored. Keen also argues that mainstream economic models are incapable of predicting a recession because it is not a possible state in those models, whereas his models do allow for recession. Not a man to mince words, Keen has been highly critical of the mainstream of economics. But now he puts that failure to react in the context of a theory of belief and decision making similar to the one outlined above. In the paper by Kahan et al, the participants were given tasks to assess their "ability to draw valid causal inferences from empirical data." The results were counter-intuitive and surprising. Numeracy – skill in understanding numbers – was a negative predictor of performance on these tasks if they conflicted with existing beliefs. 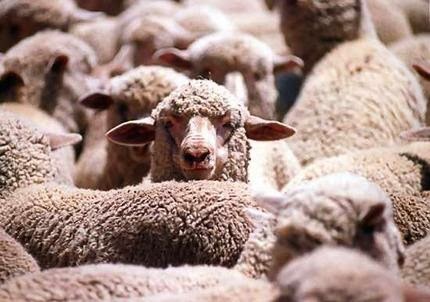 Individuals, on this account, have a large stake – psychically as well as materially – in maintaining the status of, and their personal standing in, affinity groups whose members are bound by their commitment to shared moral understandings. If opposing positions on a policy-relevant fact – e.g., whether human activity is generating dangerous global warming – came to be seen as symbols of membership in and loyalty to competing groups of this kind, individuals can be expected to display a strong tendency to conform their understanding of whatever evidence they encounter to the position that prevails in theirs. Steve Keen (emphasis added). Kahan et al. extend the problem of salience of information to the social setting. Professed beliefs are often explicit markers of group membership and being well versed in group jargon and able to articulate group beliefs is part of what determines one's status in the group. In an economic setting, mainstream economists are able to ignore facts (such as a very high correlation of the rate of change of debt to the employment rate) that might change their worldview (particularly the way they view the role of debt in economics) because their status as members of a group requires them to conform to norms which are in part defined by holding a particular worldview. They are blind to facts which challenge their views. Keen points out that this is not a new observation and that some years ago that the great physicist Max Planck, who had struggled to have his work accepted by his peers, quipped that knowledge progresses "one funeral at a time". This result reinforces the limitations of thinking of human beings in terms of individual psychology. It's a hard habit to break in the West. We are influenced by Freud, the Romantics, and the various revolutionary thinkers who championed the rights of individuals. Of course to some extent we are individuals, but not as much as we make out. Much of the inner life that appears to make up our individuality, is in fact determined by conditioning in various groups (family, peers, nation, religion, education) and by our place within these groups. We simply do not exist in isolation. Any philosophy of consciousness, mind, or morality which sees individuals as the main subject for study is of limited value. And the practice of trying to make valid inferences from the individual to the group is less likely to be accurate than the other way around. At the very least individuals exist in a series of overlapping gestalts with various groups. This view of people will most likely conflict with what we know. Most of us are convinced that we are individuals, who make our own decisions and think our own thoughts. We live in a society which highly values a narrative about "reason" and about what a reasoning individual is capable of. However, very few people are convinced by facts because that's not how reasoning works. That view of reason is isolated from other aspects of humanity such as emotions and our behaviour as social primates. Those people who bombard us with facts fail to convince. By contrast the advertising profession has long understood that in order to change minds and behaviour one must change how people feel about the facts. Half the ads I see nowadays have almost no intellectual or factual content. It's all about brand recognition (familiarity) and a positive emotional response. One might say that for advertising the facts are now irrelevant. And so, liberals campaigning for protection of the environment, say, often fail to convince a sizeable proportion of the population or indeed anyone that disagrees with them to start with. Meanwhile advertising is a multi-billion pound industry, consumerism is rampant, and the environment is daily degraded in the direction of being unable to sustain human life. Most people cannot be reasoned with, because neither people nor reason work the way they are popularly conceived to work. Those of us who want to make the world a better place must pay close attention to these issues of how people's minds actually work. If we want to convince people that we have a better solution it cannot be through facts alone. They must feel that what we say is salient in the context of their existing values. And even then, if what we say conflicts with strongly held beliefs then we can expect to be ignored. We tend to get so carried away in our enthusiasm for our own values that we fail to empathise with those whose minds we really need to change in order to change the world: i.e. political, military and business leaders.